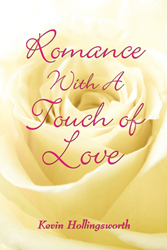 Kevin Hollingsworth wants to touch souls with his inspiring poetry collection "Romance With A Touch of Love." "My American Princess was a blessing uncovered, and I am glad I found her. She was freedom’s most darling endeavor. Beauty delivered her and the Stars and Stripes crowned her. My American Princess, I love you so.” - From poem, "American Princess"
Romance and love are integral in life. All the riches in the world can’t replace a tender moment with a loved one. Words of love can be beautiful, inspiring, complex, and sometimes even confusing. In this wonderful collection of poetic thoughts, the author shares the very essence of being human in a way that everyone can relate to. Readers will find a thread that resonates with their own experience, from appreciation of women to the pain of rejection: from the joy of new love to the devastation of loss. With endearing honesty and artistic work painting, these pages provide a glimpse into the depths of human experience in a way that will touch each reader somewhere, somehow, and in some way. The compelling book of poetry ROMANCE WITH A TOUCH OF LOVE (ISBN: 978-1-43277-138-6) is now available in paperback for $7.95 (Kindle $1.99) and can be ordered through Amazon.com.